The day before Christmas we had tickets to visit the set of Harry Potter, which is based at the Warner Brother’s studio just outside of London in Watford. I had been waiting months for this day and it would not disappoint. It’s very cliché of me to talk about how much Harry Potter means to me, but lets face it, Harry Potter has come to define the childhood of my generation. Having been said literally a million times before, I’m going to say it one more time, Harry Potter changed my life. It was a huge part of growing up and I can’t imagine what my life would be like without these stories. I always loved the fact that each year a new book came out, Harry and I were the same age. No, I never had to fight any Dark Lords (except maybe my parents), but I still felt like as I grew up, Harry was growing up with me and I could relate to many of the emotions he was going through. The Harry Potter books were important, because they taught me about loyalty, love and courage, but they also meant sometime much more to me. It’s easy for any book to spew morals out at readers, but it’s harder for a book to leave a lasting impression on people’s lives. That type of thing is only achieved through the best of books. For me Harry Potter is memories. My parents were the ones who introduced my sister and I to the books sometime in 1998. Before my sister and I went to sleep every night they would plunge us into the dazzling world of Harry Potter. Soon the books were just too good to read only at night. When my family and I went to Sunriver, a resort in Southern Oregon, we listen to the books on CD for the four-hour drive. On the audio CD’s there was a british man who acted out all the voices and made the books all the more entertaining. The long drive to Sunriver would have been the perfect opportunity to catch some sleep, but my sister and I would always stay awake, listening to Harry battle monsters and overcome all challenges. When the new books came out, usually over the summer, my family and I would always be at the beach. Therefore, we would drive every summer about a half-hour to get to Lincoln City, where there was a little bright blue bookshop, called Bob’s Beach Books, that sold the books at midnight. My sister, my friends and I would buy the books on the hour and then hungrily read them as we drove home. Despite the fact that I get sick from reading in the car, I still couldn’t put the book down. Soon the midnight release of the books got big enough that it was moved to the public library and a bunch of dedicated fans would sit around reading the previous book before midnight. The books themselves hold memories too, and I mean both in a literal and figurative way. When I open any of the Harry Potter books, I can remember where I was when I read them. One of the pages in the 3rd book has a grass stain on the side from when I sat in our backyard in the summer, or a corner of the 4th book has been bitten of, because my rabbit decided he was hungry. I remember where I was when I cried because of Dumbledore’s death and I remember exactly where I sat when I closed the last page of the last book. I can still recall the feeling of finishing the entire series. The satisfaction of having a wonderful story finally finished and the tinge of sadness, knowing that another book would never come. Perhaps even more important than anything, Harry Potter taught me to love books. I read a lot before the Harry Potter books, but nothing came close to exciting me in the way that they did. Books are precious things and it’s thanks to Harry Potter that I think this way. These books taught me that I could go anywhere my mind could imagine, that I could be anyone I wanted to be and that I could face any challenge that I came up against. Harry Potter taught me that there are billions of journeys that I haven’t even started and it gave me a hunger to devour as many stories as I possibly could. It was the start of a journey that will last me a lifetime. Just like the books, the Harry Potter movies were as important. Most of the movies would come out in November, right around my birthday. My friends and I would stand in line for hours waiting for the midnight premiere and just like in the books, the actors grew up and matured right along with me. So, if you were wondering why this visit meant so much to me, there you have it. 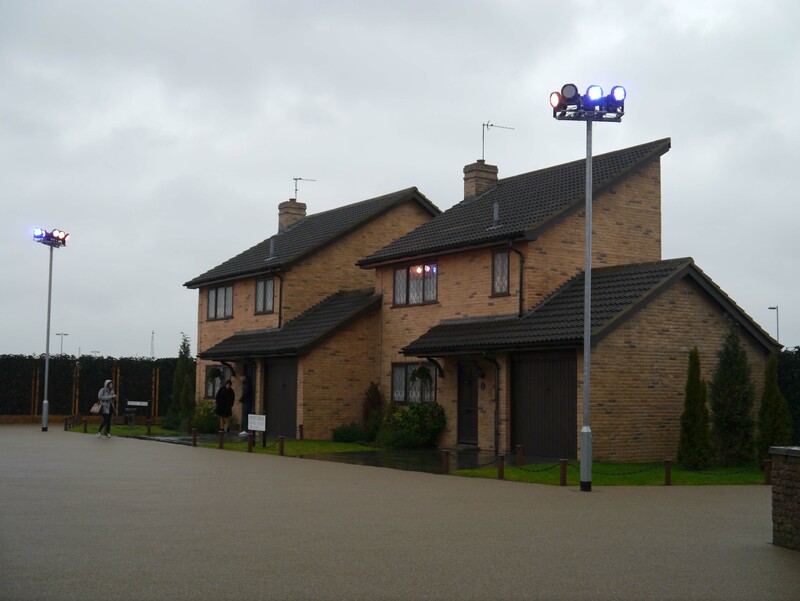 All these memories culminated into a sort of emotional visit to the Harry Potter set. Thirteen years (more than half) of my life. 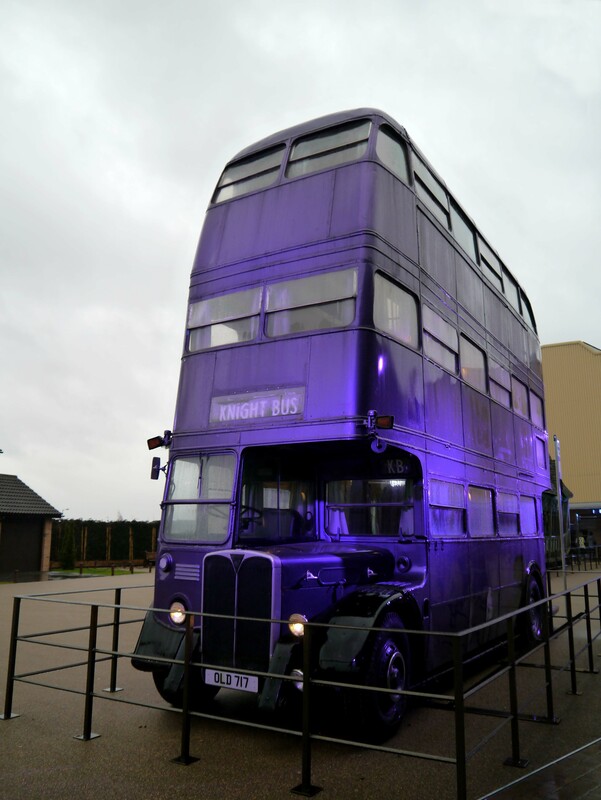 We took a train from London to Watford Junction where a double-decker bus plastered in scenes from Harry Potter picked us up. The bus drove us directly to the set, which was about 20 minutes down the road. The town itself was very cute, with small houses and quiet roads and it reminded me of Privet Drive. One of the chess pieces. There were three of them outside, all of them were around eight maybe nine feet tall. 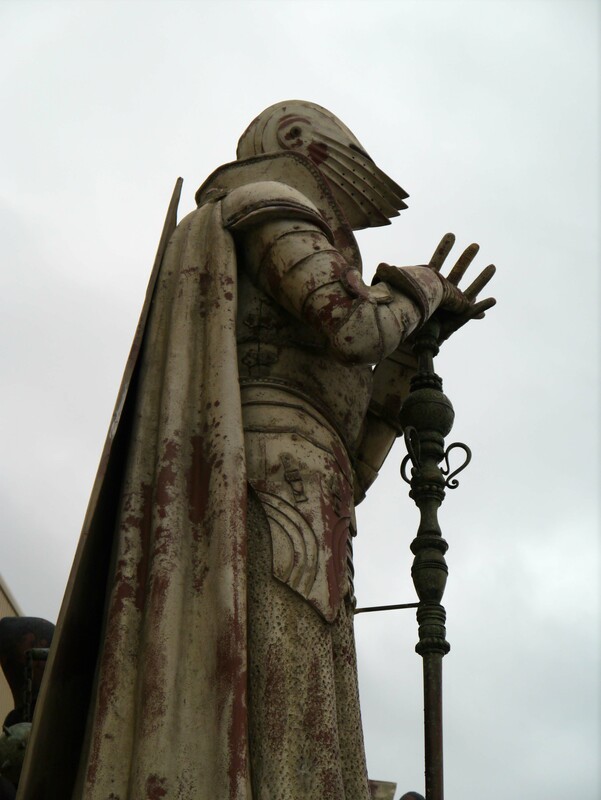 There were a number of other chess pieces inside the studio as well, but many of them were actually destroyed during the filming process. Outside the studio we talked to one of the employees about what it was like to live where they were filming. She said that there was a lot of security and they were never able to get close enough to see any of the actors, but sometimes they would see explosions from the fields and know that a movie was being filmed. Once inside the studio we could only line up if we did a dance, our choices were the robot, moonwalk or gangnam style. I chose the moonwalk, but most people did gangnam style, it was great entertainment while waiting in line. 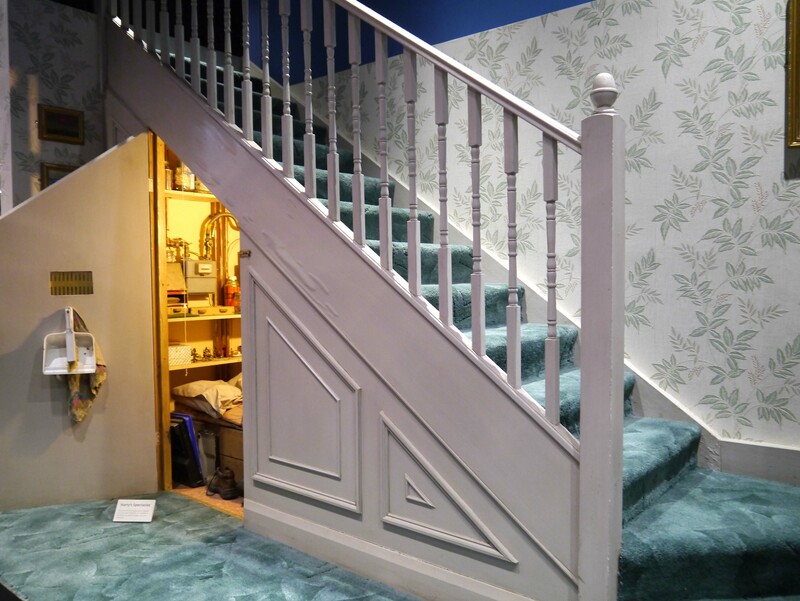 Harry’s cupboard under the stairs. It stood off to the side of the line so that we could peer in as we walked by. The line filed us into a small room with screens hung up around the walls. 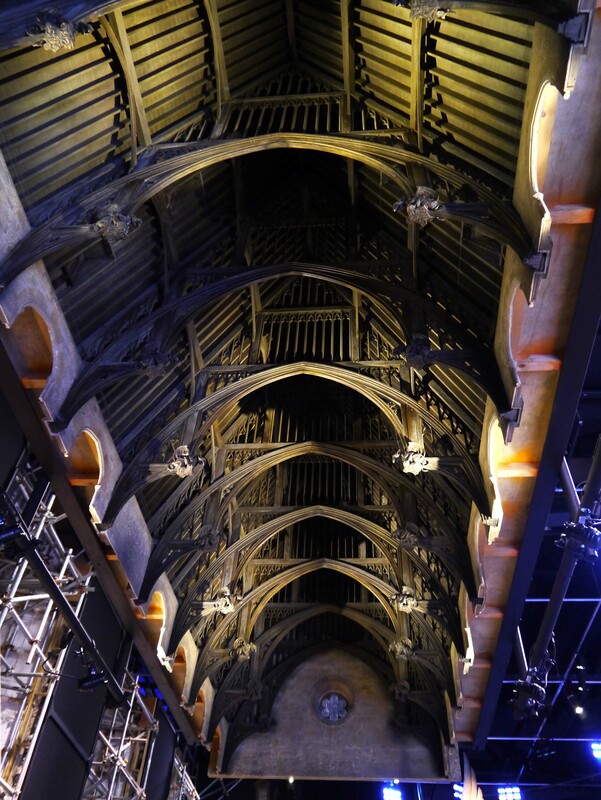 They showed all the countries that the films were released in and from there we entered a small theater where Daniel Radcliffe, Emma Watson and Rupert Grint introduced the set on the screen. After the short film ended the movie screen pulled up and suddenly we were standing in front of the entrance to the Great Hall. 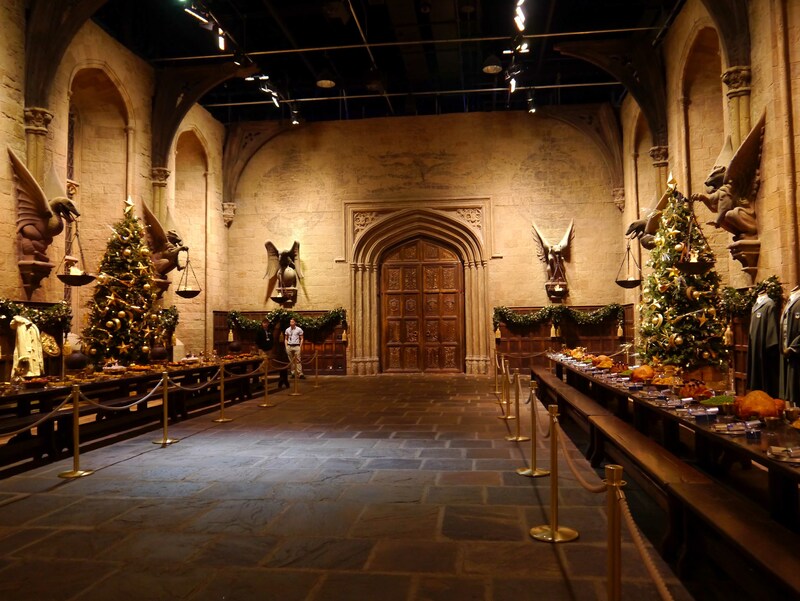 The Great Hall was decorated for Christmas and the tables for Gryffindor and Slytherin were standing on opposite sides of the hall. All along the tables are fake pieces of food. Originally, they used real food, but as you can imagine it began to get a little smelly after a few days. The hall was a lot smaller than it seems on-screen and there is no real ceiling. The floor is entirely made out of stone. There were a lot of details in the hall that I’d never noticed before in the movie. 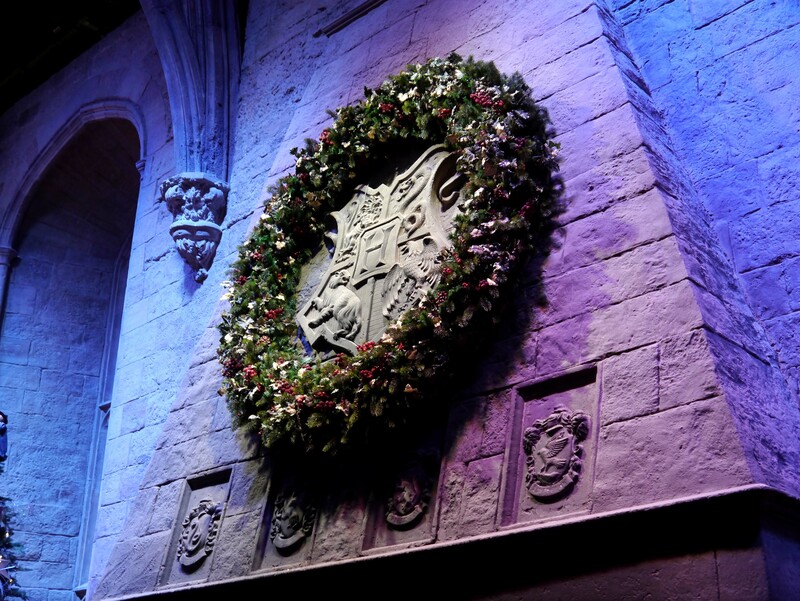 The Hogwarts crest is engraved over the fireplace. Next to the hall doors there are very faint paintings on the wall, which were first painted and then faded to look hundreds of years old. All around the tables stood mannequins with the original clothes worn by the characters. Harry’s first cloak stood behind the Gryffindor table. 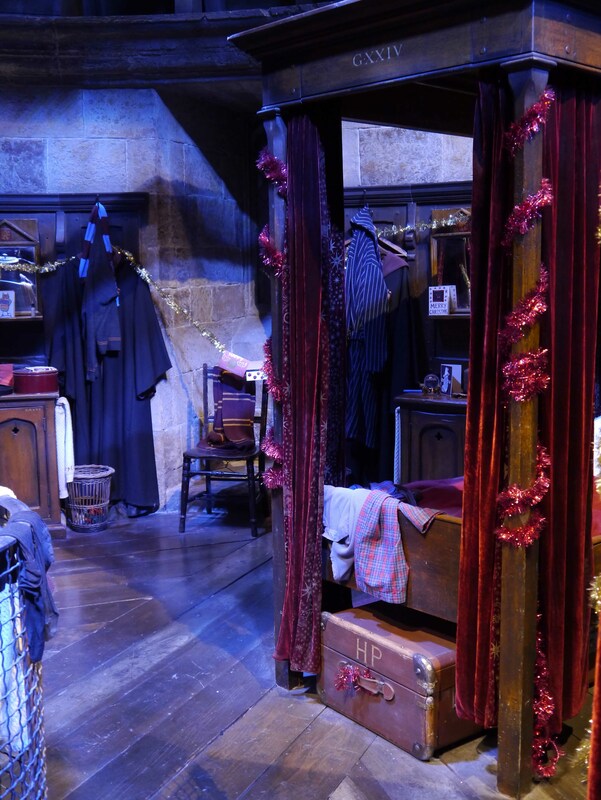 At the front of the hall was the wardrobe for Dumbledore, Hagrid, Flitwick, Snape and a few other characters. Hogwarts crest over the fireplace. 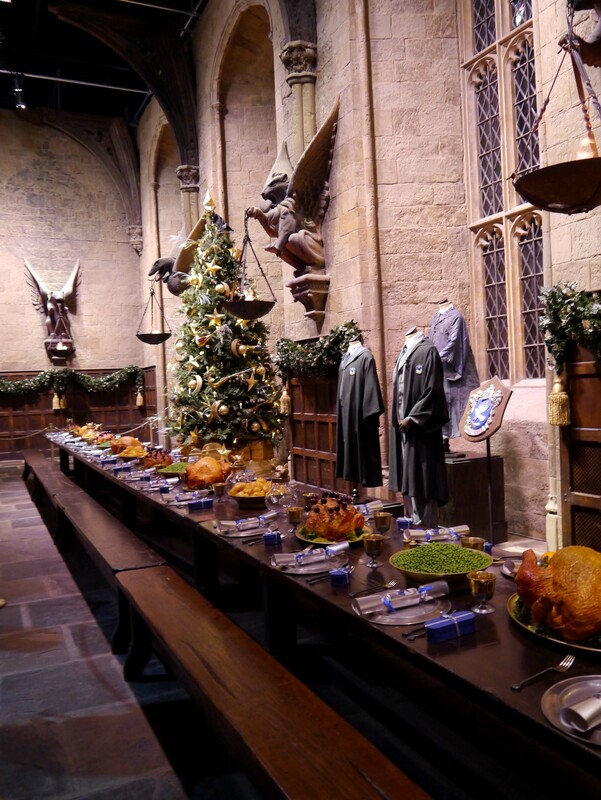 The Great Hall then opened up into a larger area with multiple sets and props. As I walked through, I couldn’t believe my eyes. 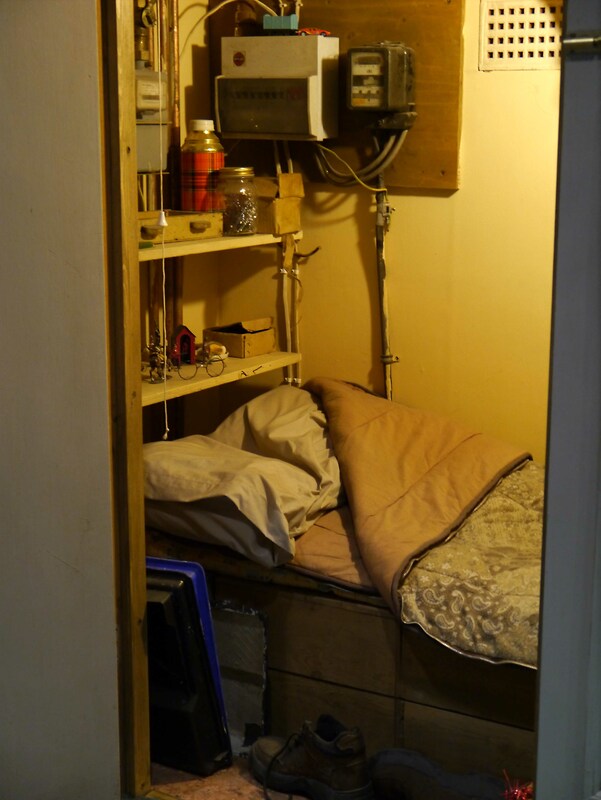 Everything was so much smaller than it seemed on film, but there was so much more detail to all the props and sets. The ceiling of the Great Hall. 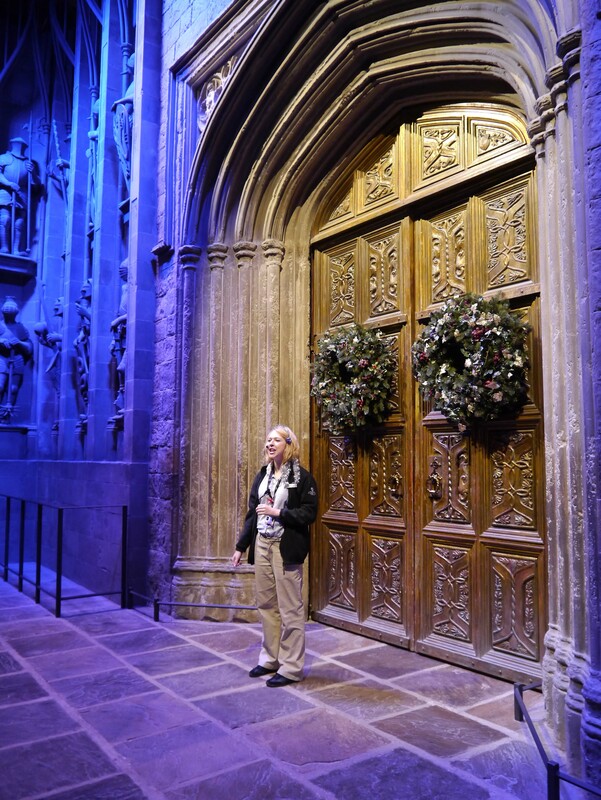 It’s probably only a little bit larger than a door, but when filmed it is impossible to tell its actual size. 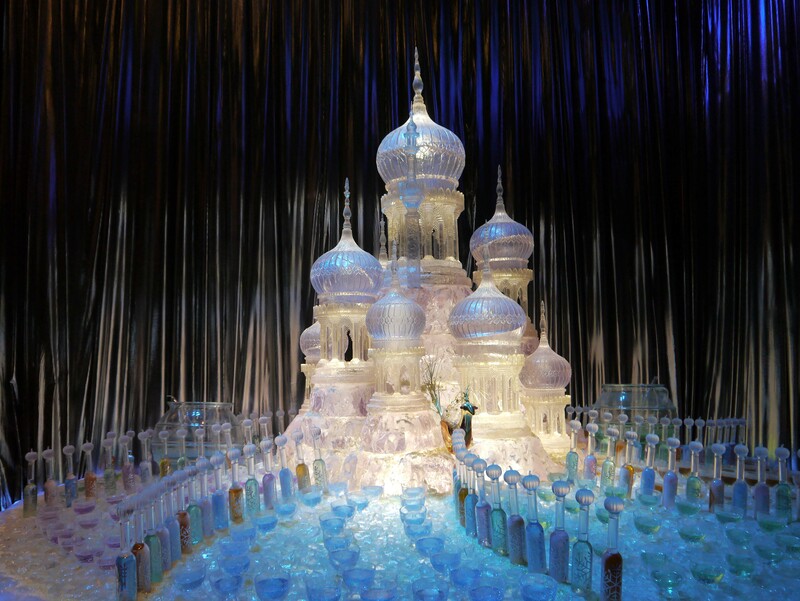 The “ice” sculpture for the Yule Ball in the fourth movie. 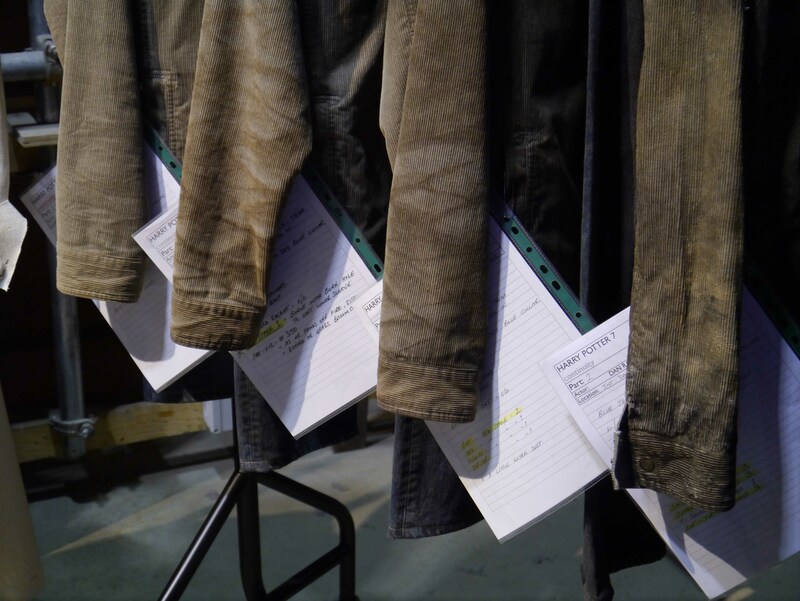 Along with the sets, there was also a wardrobe area with many of the wigs and clothes worn by the characters. What surprised me the most was that the many stages of change in the wardrobe of each individual character was meticulously thought out. Below is the shirt Harry wore in the last movie. You can see the different stages of wear and tear as the movie wore on. An optical illusion. The chair is probably the perfect size for a doll in real life. 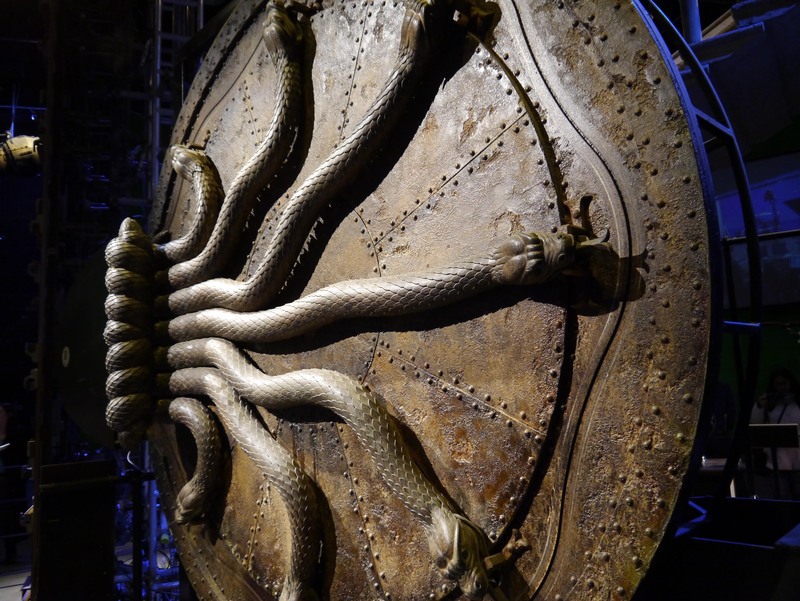 The giant door to the Chamber of Secrets. The snakes can actually move like they did in the movie. The same is true for the vault into Gringotts. 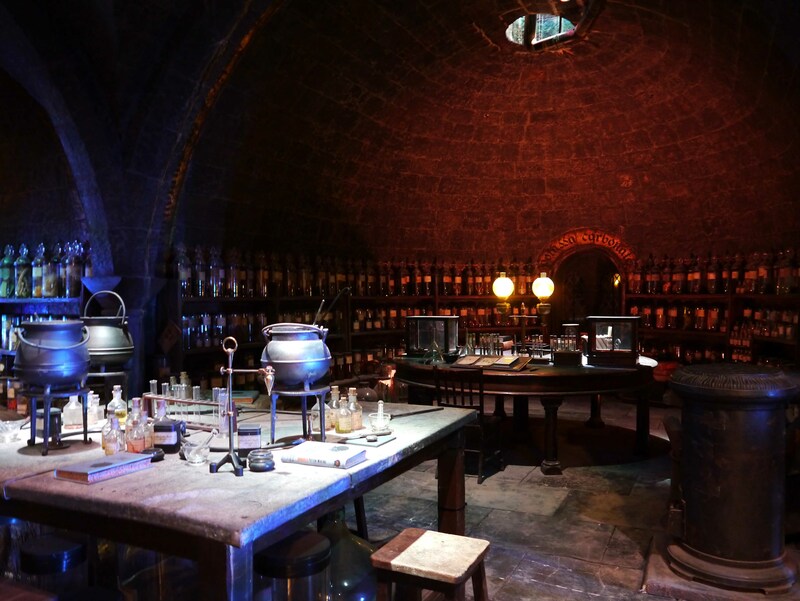 The potions room. Many of the potions were stirring themselves. 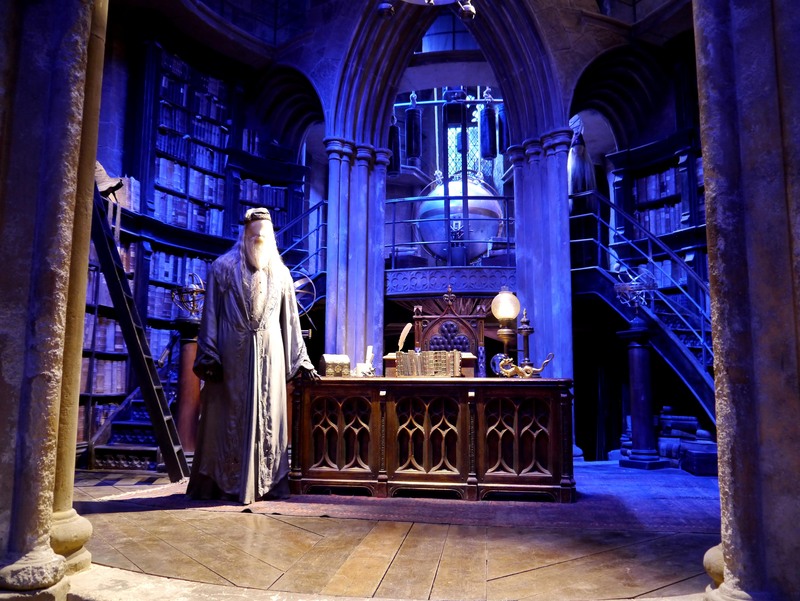 The entrance to Dumbledore’s office. This particular piece does not move, but there is also another one that turns into stairs and spirals up. 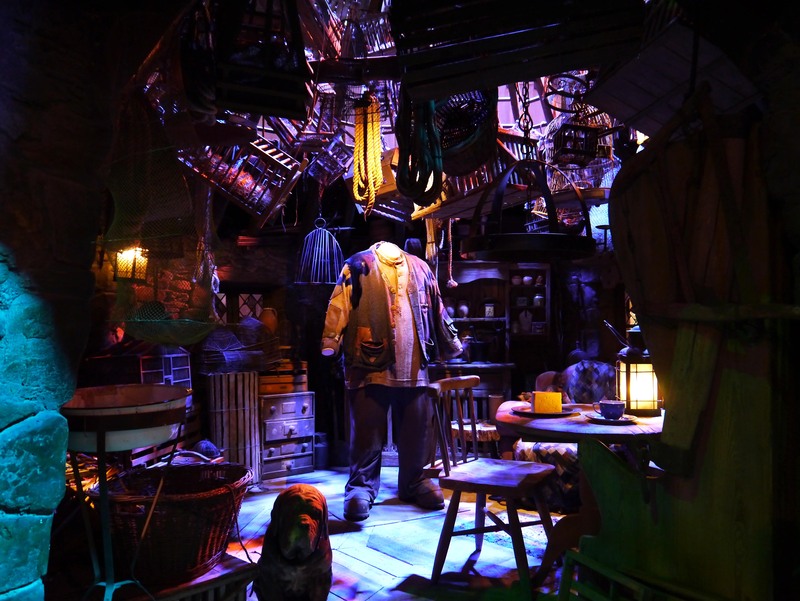 Hagrid’s Cabin. For many scenes in the movie, Hagrid’s head was fake to make him look taller. 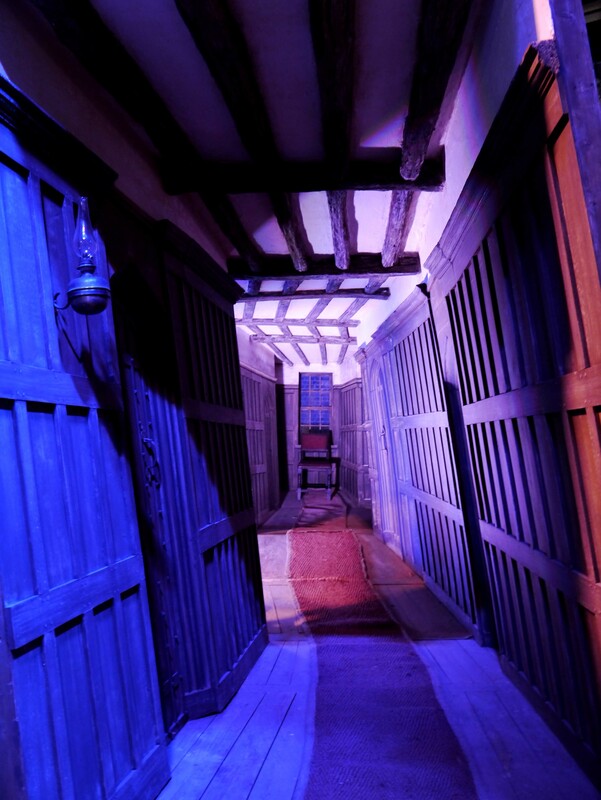 Along with the sets above, there was also the inside of the burrow, the Gryffindor Common Room, and the fireplace of the Ministry of Magic. Along the way there was a room where we were all given cloaks and the chance to ride a broom with a green screen in the background. The brooms were surprisingly comfortable and easy to sit on. A metal seat was built into the broom and it was covered by the cloak so that it wouldn’t be filmed. 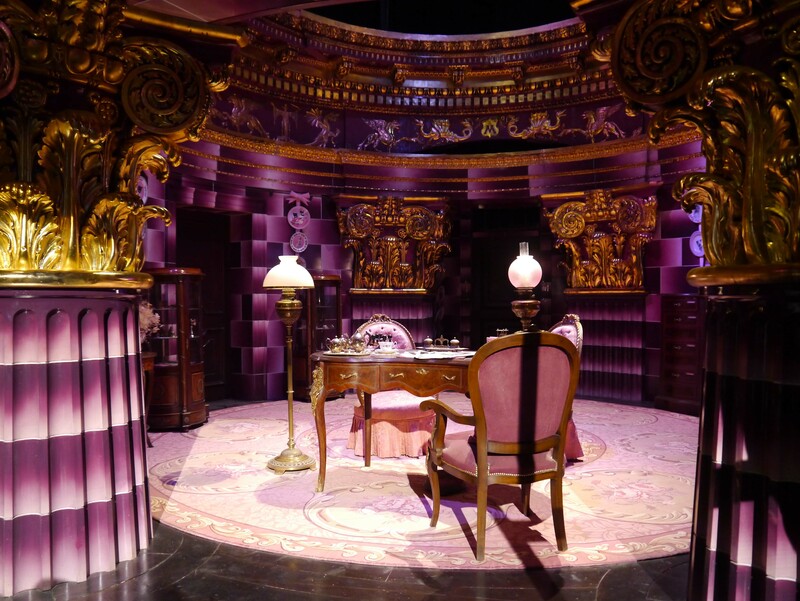 The large set room exited into the backlot, where some of the larger sets and pieces are kept. Outside, we had lunch and our first taste of Butterbeer, which was super sugary soda with some sort of cream on top. 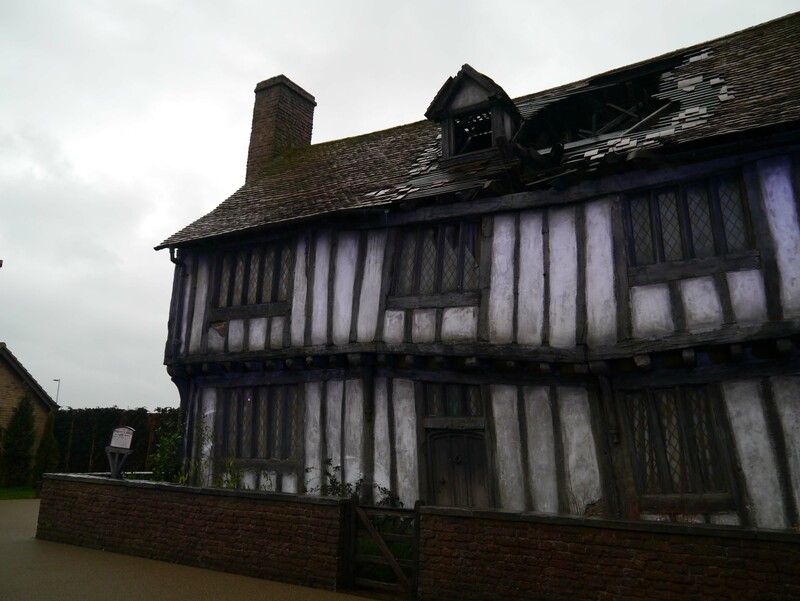 Harry’s destroyed home in Godric Hollow. 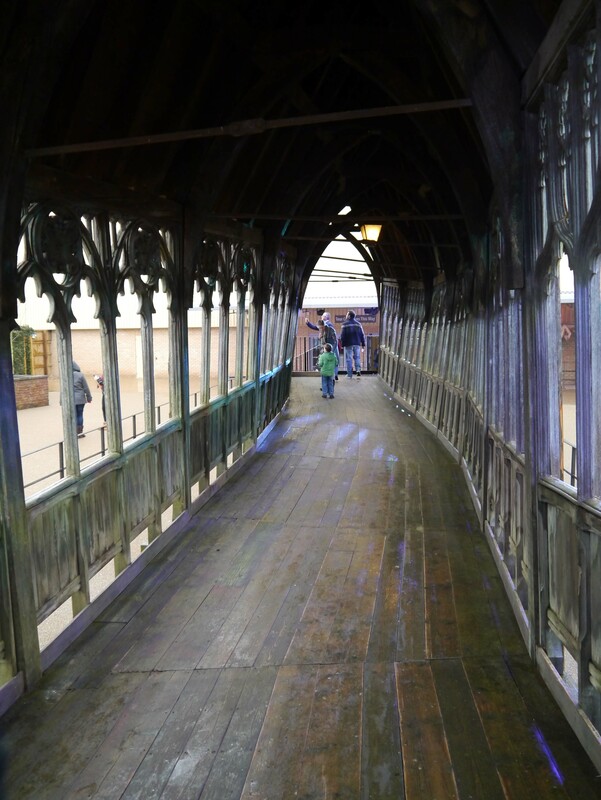 The crooked Bridge to Hogwarts. Although not in the original books it was important in the movies. It was disorienting walking along the slanted path. It was raining while we were outside so we hurried along after making sure that we had taken enough pictures of the sets. The next room was all about the magical creatures and animatronics. I was even more surprised after exploring this room. A lot of the creatures that I thought were completely computer animated were actually sculpted and made into a robot. Many of them could move on their own. One of the more impressive creations was a life-sized robot of Lupin as a werwolf. He probably stood eight or nine feet tall. The creators also made a rigging that attached the wolf’s head to the actor, but it turned out too heavy and so they had to scan it into the computer. 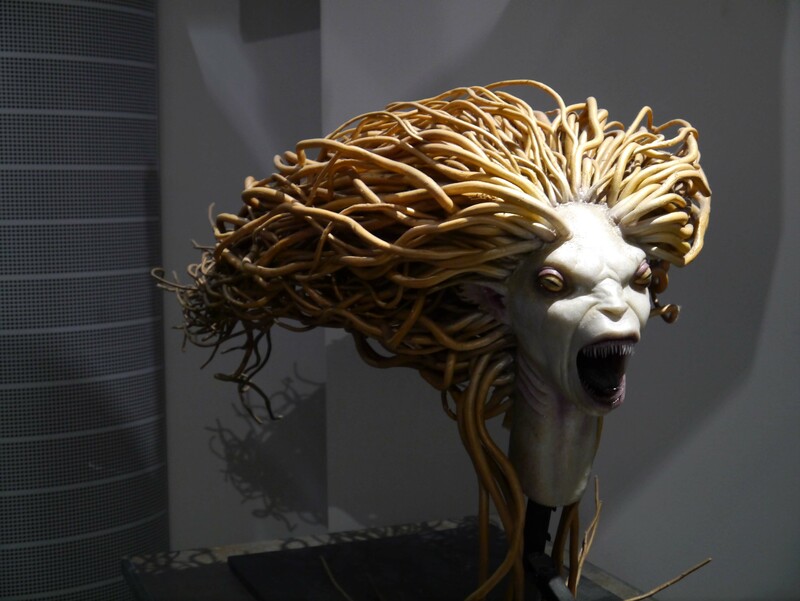 The head of a mermaid. 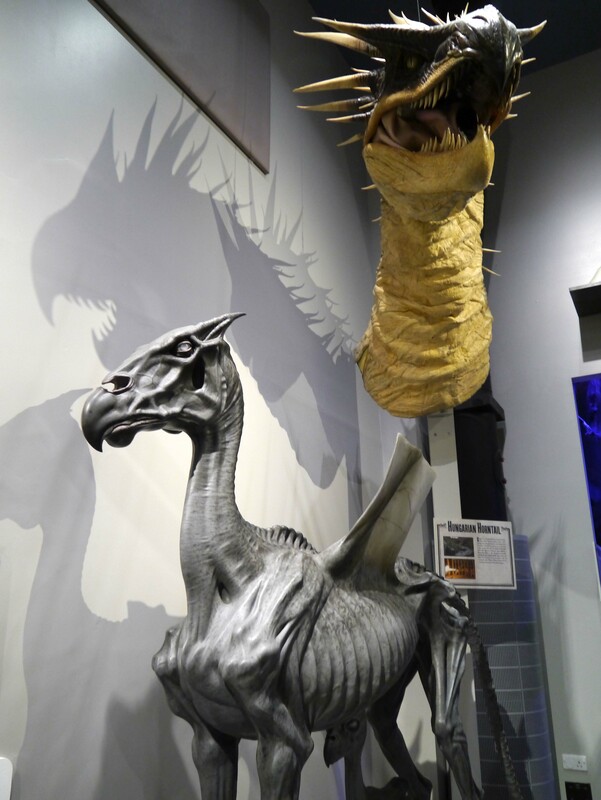 A full-sized Thestral to the left and the head of the Horntail on the right. 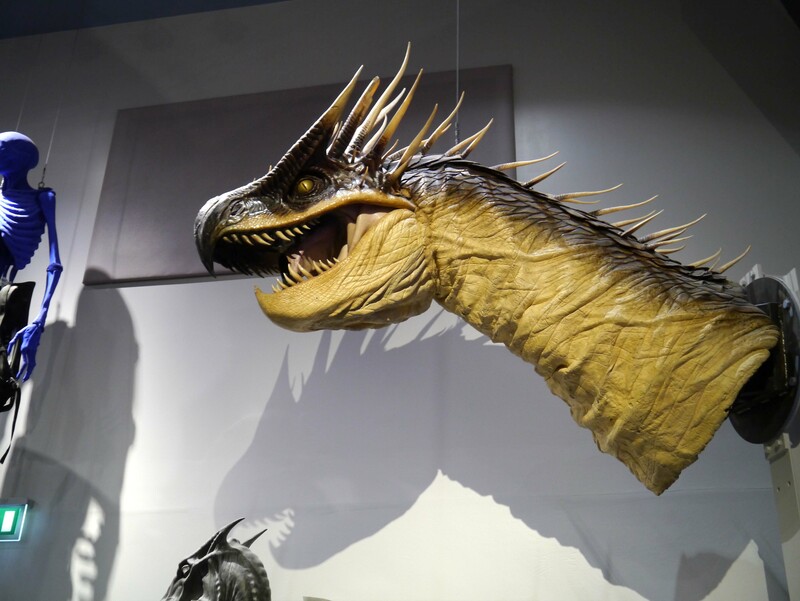 This dragon head actually breathed fire during filming. 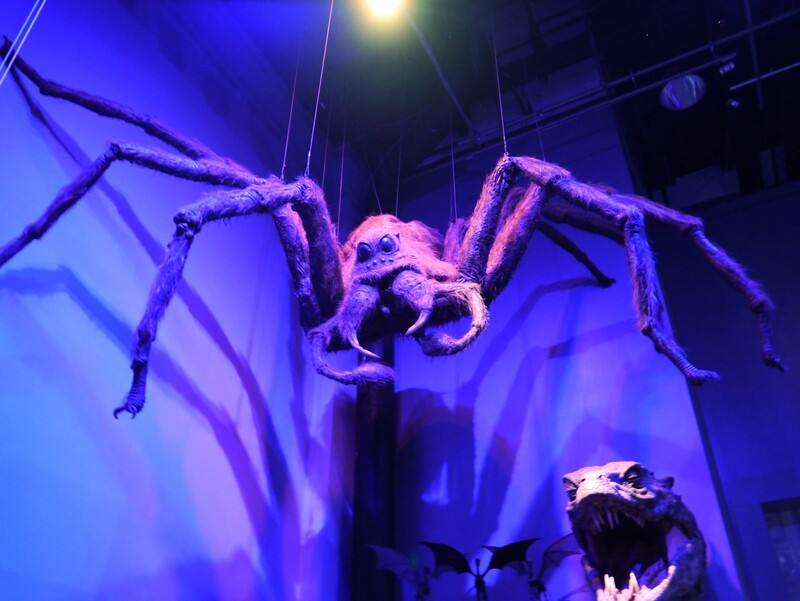 Aragog, the giant spider. 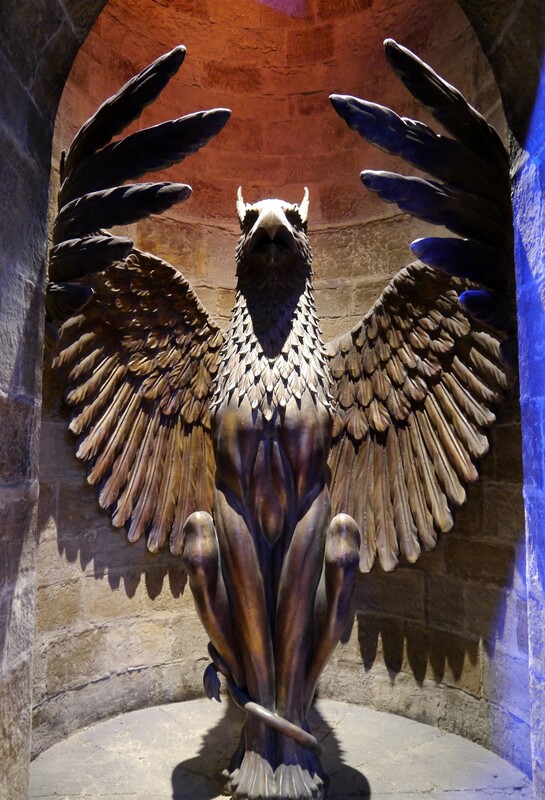 The head of the Basilisk is in the corner and it’s skeleton sat just below. 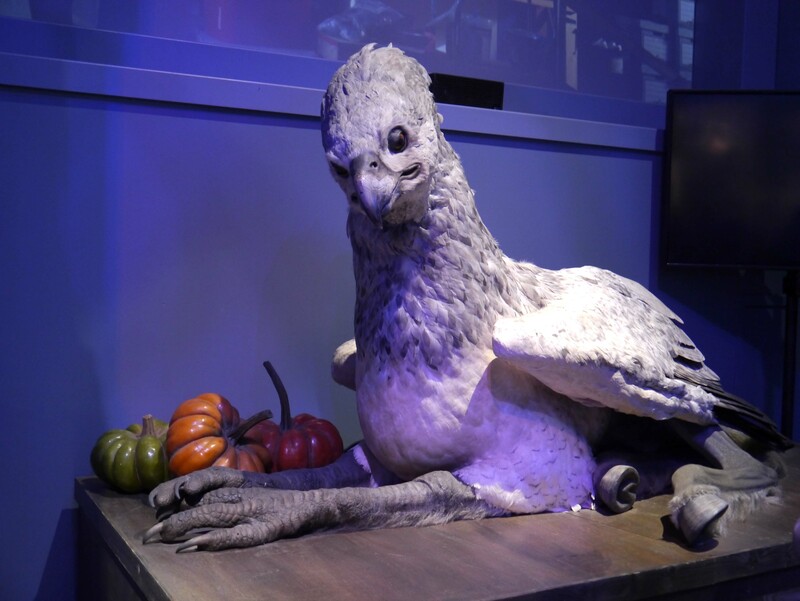 My favorite animatronic creature was Buckbeak. He actually began moving while we were there and we got the chance to bow to him. He was incredibly life-like. 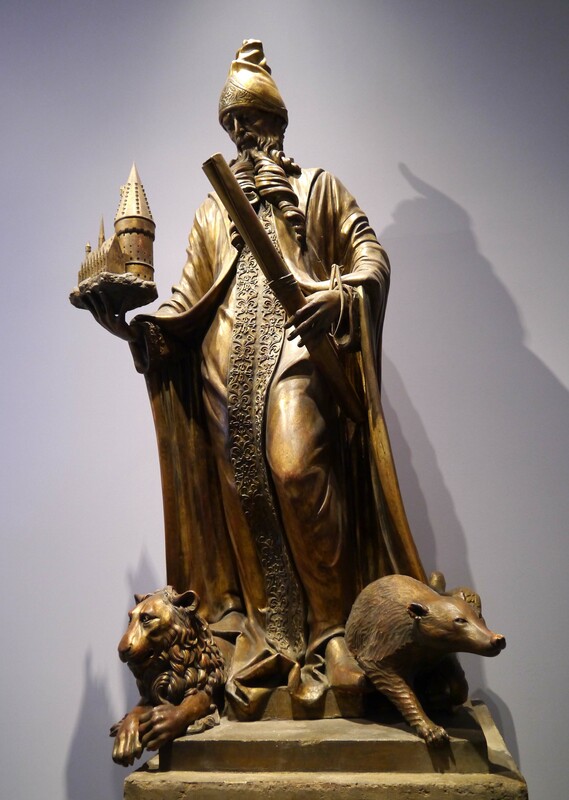 The architect of Hogwarts. He wasn’t originally in the books, but was added into the movies. The fact that the creators of the HP films added so many extra details to the films was something that I had never realized before and really makes me appreciate the process a lot more. After going through the sets, I need to go back and re-watch the movies and try to catch some of the things I saw. 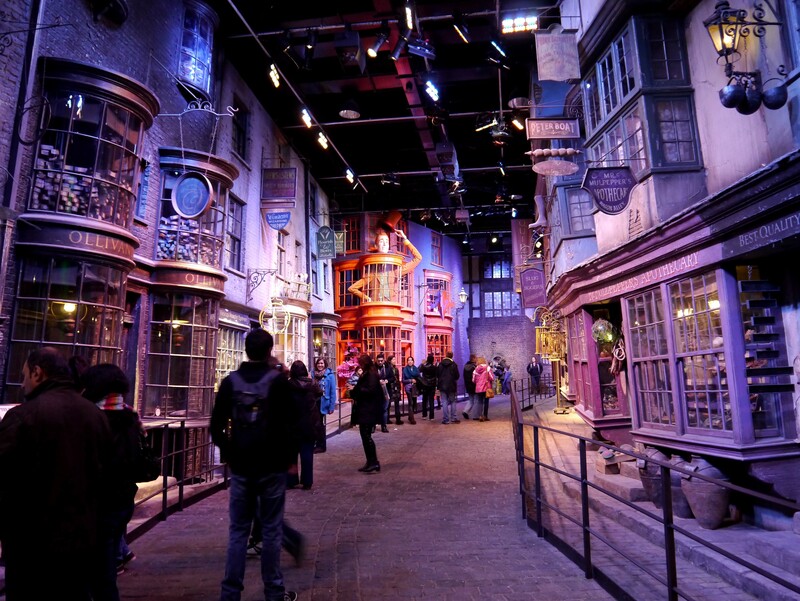 After exiting the animatronics room we walked straight onto Diagon Alley. Like many of the other sets it seemed so much smaller than on-screen. Many of the stores were destroyed from their last film, but the attention to detail was dazzling. Gringotts stood at the beginning to the alley and a patch of snow sat next to it. The snow would sink in as if Harry were walking under the invisibility cloak. After passing trough Diagon Alley we were brought into the drawing-room, where everything that we had seen that day first came to life, as diagrams and paintings and even small paper models. 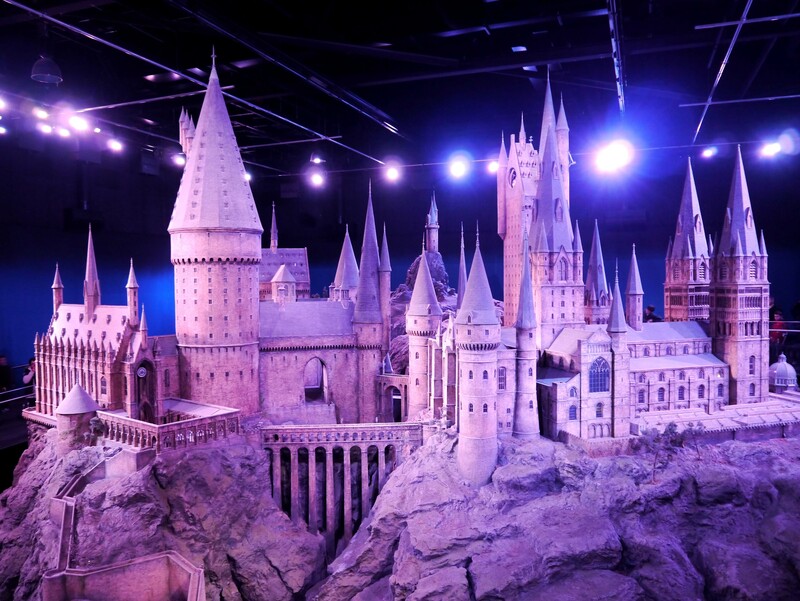 As we passed through the planning rooms we rounded the corner and were met by a full scale model of Hogwarts, which was used for shots of the castle. As we walked around the model the lighting changed through the cycle of 24 hours and when the lights went down little flames flickered inside the windows of the castle. 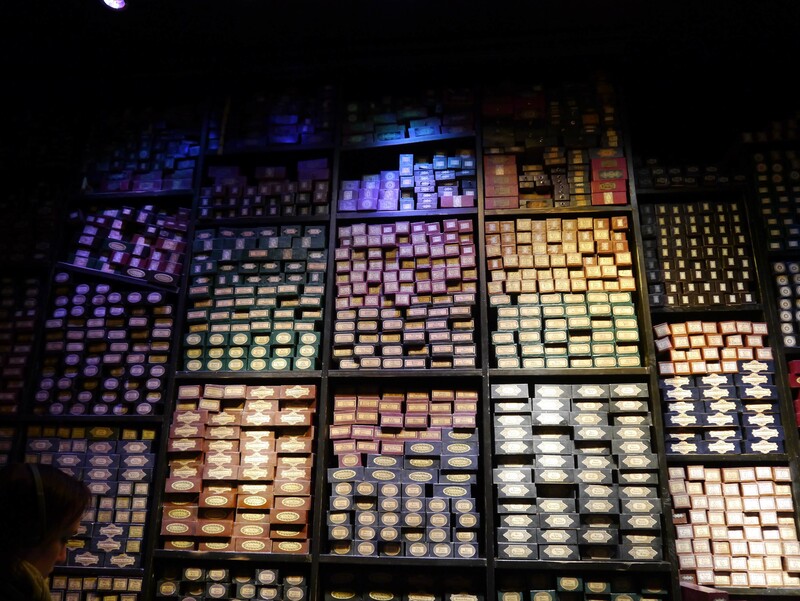 The final room was filled to the ceiling with wand boxes, which had the names of every single person who worked on the movies. The boxes covered all four walls, top to bottom. 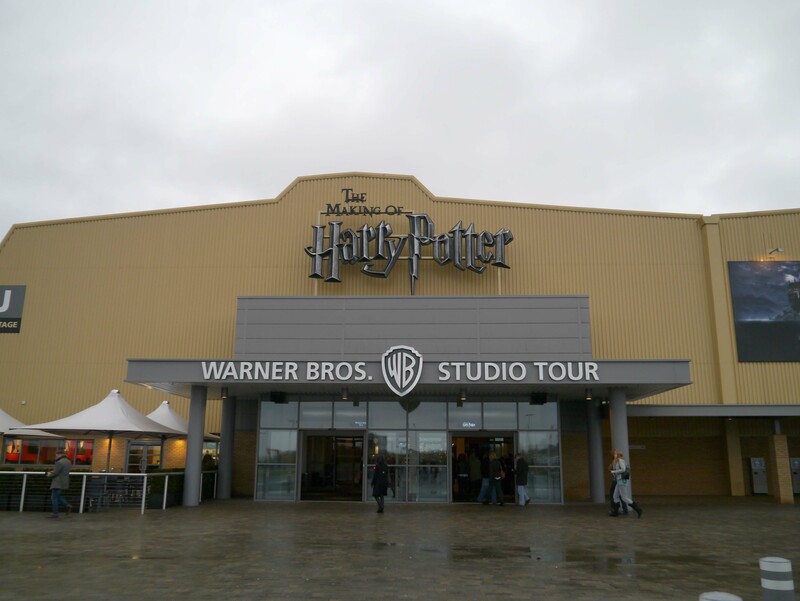 I didn’t want the tour to end, but it really brought the entire experience of Harry Potter into perspective and it won’t be something that I will forget soon.